Service to the community is a hallmark of first responders. Joining a search and rescue team is a great way to give something positive back to your friends and neighbors – using your unique skills to help others. Membership in LASAR is open to anyone above the age of 18. You should be interested in the out of doors and willing to get dirty, bruised, and cut while wandering through the bogs, streams, and berry bushes we see on most searches. We provide monthly training in map and compass, GPS, First Aid, CPR, survival skills and so much more. 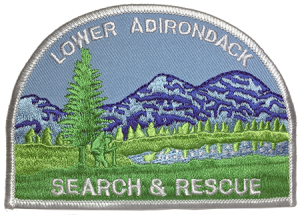 If you join our team, you will also be asked to complete a Basic Search and Rescue course offered by the New York State Forest Rangers and to take three FEMA courses on-line; all of these are free. We do not provide basic outdoor gear – that is up to you. Your personal needs are basic survival gear when out in the elements and a willingness to use and share your talents. What we really want though is someone who loves being outside, has a willingness to learn, enjoys a challenge, and wants to provide a needed service to others. Come to one of our meetings, and see what we’re all about!